confusion and difficulty. It also includes an extensive index, glossary of linguistic terms and numbered paragraphs designed to provide readers easy access to the information they require. 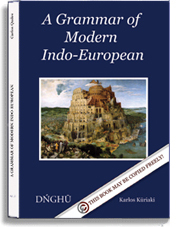 An essential reference source for the learner and user of Indo-European, this book will be the standard work for years to come. 10/1/2009 :: (v. 3.86) One word missed in the Proto-Italic version of Schleicher’s Fable. 09/1/2009 :: (v. 3.85) First full revision heading for version 4. All sections revised, but for Etymological Notes. 30/7/2008 :: (v. 3.45) Introductory section titles revised. Scheicher’s Fable posted in more proto-languages to fill the extra page created by rev. 3.43. 29/7/2008 :: (v. 3.44) Greek loan word “Proto-” translated to Europe’s PIE “prmo-“. Etymology notes section revised accordingly. 28/7/2008 :: (v. 3.43) Introduction to the Proto-Indo-European timeline revised, some notes added: on the terms “Indo-European”, “European”, “Europe’s Indo-European”. About the criticism to the “language revival” concept used for proto-languages: added information on trends to call Modern Hebrew “Israeli” due to differences with “Ancient Hebrew”. 25/7/2008 :: (v. 3.42) Introductory section on Armenian; “Graeco-Armenian” question revised. 06/5/2008 :: (v. 3.40) Meaningful corrections, including translation of proper names (Carlos and France), IE ari(j)os, etymology of Gk. theos, ekklesia, geo, verbal forms, etc. 12/4/2008 :: (v. 3.37) Minor corrections, including phonetics, s-mobile, IE meitos, preismos. 16/3/2008 :: (v. 3.36) Numbers section improved. Indo-European day (Eur. dínom, not déinom), and daylight (Eur. dhṓchōs, from dhech, not dághōs, from agh) corrected. 12/3/2008 :: (v. 3.35) Indo-European Schleicher’s Fable and the Italic, Celtic and Proto-Greek reconstructions revised. 18/1/2008 :: (v. 3.34) Latin “Penultimate rule” corrected. IE rodo‘s proper meaning “gnaw”. Classification of lineqmi(linqo)-type verbs moved to a new suffixed athematic conjugation. 1/1/2008 :: (v. 3.33) Schleicher’s Fable in Indo-European and its Proto-Languages reconstructions revised following our own publications. 30/12/2007 :: (v. 3.32) Newer revision of Personal Pronouns. 18/12/2007 :: (v. 3.31) Full and thorough revision of Personal Pronouns, thanks to Fernando López-Menchero and his own work on the Proto-Indo-European Personal Pronouns. 16/10/2007 :: (v. 3.30) Revision of Nouns, Third Declension, –u: Locative and Instrumental in –ei and –i. Added etymological note about PIE (a)re-, thanks to Fernando López-Menchero. 15/10/2007 :: (v. 3.25) Mistakes in Verb tables: imperatives written in first and second rows. 20/7/2007 :: (v. 3.24) Some translation (like reconstructable) and syntax mistakes corrected. Few information added or changed. 14/7/2007 :: (v. 3.22) Notes: Mali-gnos, “malign”, (as dweni-gnos, “benign”), comes indeed from zero-grade gnos, not from chnos. 13/7/2007 :: (v. 3.21) Added important missing information to the pronouns, or just corrected. Thanks to the contributions of PhD. Olivier Simon and to the work of Fernando López-Menchero about the Indo-European Indefinite and Demonstrative Pronouns. 12/7/2007 :: (v. 3.20) First Printed Edition, Final Version – Changes in Content and Design. 27/6/07 :: (v. 3.15) First Printed Edition, Release Candidate III – Minor Changes in Content and Design. 23/6/2007 :: (v. 3.10) First Printed Edition, 2nd Major Version (Release Candidate II) – Minor Changes in Frontpage, Major Changes in Content and Design. 04/6/2007 :: (v. 3.02) Anglískos has obviously root accent, i.e. Ángliskos, as Téutiskos, and so on. Also, Europáios is irregular, following the different modern IE languages, as it could be ‘purer IE’ Európaios or later ‘Graeco-Latin’ Europaíos (Europaéus). 03/6/2007 :: (v. 3.01) Feminine in (v. 2.0) page 86 instead of “femenine”, thanks to M.Barnett. 02/6/2007 :: (v. 3.0) Major changes have been made, some chapters rewritten and some others added. Thanks to the collaboration of Fernando López-Menchero, including a table on the Proto-Indo-European Noun Morphology and a thousand other corrections sent via email. 06/5/2007 :: (v. 2.16) Minor style changes – more links are added for quick references. 05/5/2007 :: (v. 2.15) Major Style Revision of footnotes, now added to the end of each section, to facilitate the reading of the grammar – thanks to Adam Cooper. 30/4/2007 :: (v. 2.12) Minor corrections on long vowels, palato-velar g, etc. 26/4/2007 :: (v. 2.10) We enter Full Second Edition of MIE Grammar. Added Remaining Major Sections about PIE Verbal Inflection, MIE Conjugations and IE Particles, already revised. Aorist-Imperfect Question solved. 22/4/2007 :: (v. 2.04) Some minor style and hyperlink errors arranged. 19/4/2007 :: (v. 2.03) Second Declension Paradigm added. 16/4/2007 :: (v. 2.02) PDF is made smaller with the same quality, and some wrong images are now correctly seen. 14/4/2007 :: (v. 2.01) Some more words and their etymologies and derivatives added. Minor corrections in noun declension. Some more information about the authors. 13/4/2007 :: (v. 2.0) Full Revision of Europaio: A Brief Grammar of the European Language. Changes listed in the Revions’ log within the book. Please go to Europaio Grammar v. 1.x (outdated).